Congratulations to Sammy Farha, Event No. 25 Champion ($488,237)! Wow, when did this final day begin? Yesterday at 3:00 p.m. was when things kicked off for the last day of play and here we are at a few minutes before 7:00 a.m. the following morning watching Sammy Farha wrap his third gold bracelet around his wrist. 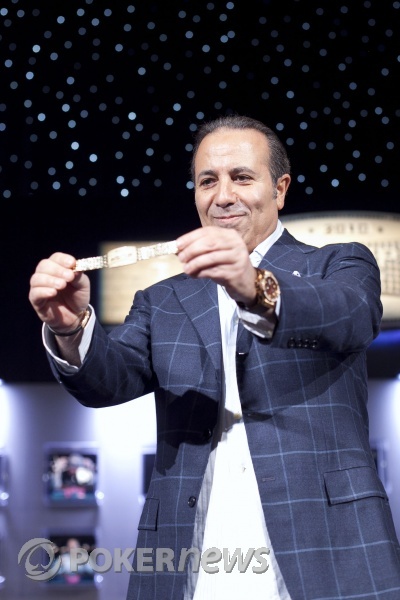 Farha holds two prior bracelets and both came in Omaha events; one in Omaha Hi-Low in 2006 and one in Pot-Limit Omaha in 1996. When asked if he considers himself to be one of the best Omaha players in the world, Farha reposonded by saying, "I think so," with a big smile on his face. The battle between runner-up finisher James Dempsey and Farha lasted just about four hours. Numerous times Farha had Dempsey's hopes looking bleak, but he was able to come back from the dead each time. Dempsey even took the chip lead from Farha a couple of times during their epic battle. Farha was asked about how he felt about the long match with Dempsey and if he found it frustrating. "I didn't get frustrated," said Farha. "That's not normally me. I didn't get a good night's sleep so I was surprised that I wan't getting frustrated, which is good." Throughout the entire match, Farha was able to keep his composure and not let it phase him that Dempsey kept coming back time after time. Farha not only scored his third bracelet and further cemented himself in the WSOP history books, he also won the first-place prize of $488,237! Congratulations to Farha for taking down Event No. 25 and winning his third gold bracelet. As for us, we're going to bed. Finally. After being crippled the previous hand, James Dempsey got his last 200,000 in the middle with . Sam Farha didn't have much of a hand either. He called with . He and Dempsey awaited what just about everyone expected would be the end. "That's not a good flop for me," said Farha. He made a pair of fours but Dempsey had all kinds of draws to improve. The turn was the . "That's a good turn for me," said Farha. "A queen would be ok on the river." The river wasn't a queen, but it was a third ten, . It took everyone crowded around the stage a moment to realize that both players had three tens, and the Farha's just barely out-pipped Dempsey's . Once Farha realized he had the best hand, he stood out of his chair, hands outstretched to each side of himself in victory. Dempsey was crushed to have fought so long and so hard and to come up just a little bit short. But he should leave with head held high. 2nd place, and $301,790, is a great achievement. James Dempsey had the button and raised before Sammy Farha reraised from the big blind and made it three bets to go. 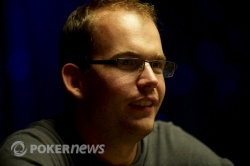 Dempsey made the call and the pot swelled to over a million chips before the flop was even dealt. The flop came down and Farha bet out. Dempsey made the call and the pot got even bigger. The turn card came the and Farha fired again. Dempsey made another call as a sea of green T25,000 chips were strewn across the felt in front of both players. The river card completed the board with the and Farha didn't slow down one bit, immediately reaching for chips and firing one last bet. Dempsey paused. He reached for his breakfast sandwich that was just delivered to him and took a big bite while he sat in the tank. "What you think you've got aces full?" said Farha before Dempsey eventually made the call. "Aces full!" 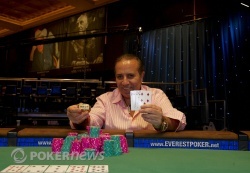 announced Farha with a big grin on his face, tabling the for a rivered full house. Dempsey complimented Farha on a nice hand and mucked his cards, having just 200,000 chips left in his stack. James Dempsey may be down to 1.9 million in chips, but he's up one cup of orange juice and a sausage sandwich, both of which were just delivered to him at the final table by one of his railbirds. Because, you know, the sun is up and it's almost 7am here. Normal people are getting out of bed, starting their days and getting ready to go to their jobs. The ones that they work at when the sun is shining. Sam Farha has just taken a chip lead -- again -- by making a running two pair on a board of . When he called sevens and deuces, Dempsey couldn't believe his ears. He stared at his own hand for about twenty seconds before mucking angrily. The blinds right now are 90,000-180,000 and the players have basically resorted to just setting them as 100,000-200,000. Even after the flop, the players are resorting to just saying the betting amounts instead of actually grabbing the chips. Heads-up play has been going for about three and a half hours now. On top of that, these players started the day more then 13 hours ago at 3:00 p.m. yesterday! Anything goes really at this time. Honestly, this couldn't get much closer.